Heat oil for deep frying in a heavy bottomed vessel. In a bowl, combine maida, cornflour, rice flour, salt, ginger-garlic-green chilli paste, pepper pwd, soy sauce, salt and all the finely chopped vegetables. Sprinkle little water to make a thick mixture. Add water little by little and use only as much water as required to form small balls. You should be able to make small balls as shown in the picture above. Carefully place each ball into the hot oil. Do not crowd the vessel. 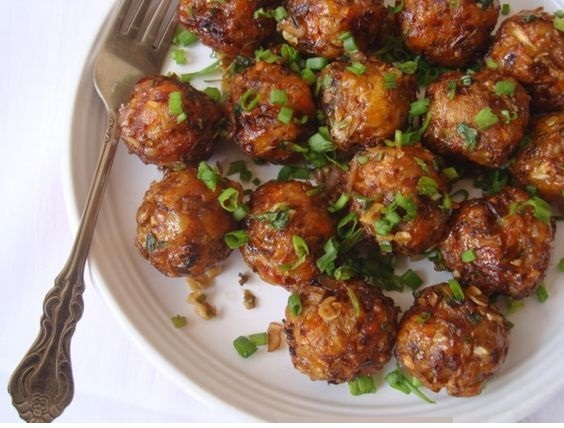 Reduce flame and deep fry the vegetable balls till cooked. Increase the flame towards the end of the cooking process and fry till they turn golden brown. Remove onto absorbent paper and keep aside.